For months now, Ted Baker has been teasing its Instagram following with clips offering glimpses of a soap-opera style sitcom, "Keeping up with the Bakers". Managed by digital agency Poke, Ted Baker’s Instagram channel has become a virtual candy-coloured neighbourhood (named Tailor Lane, of course). 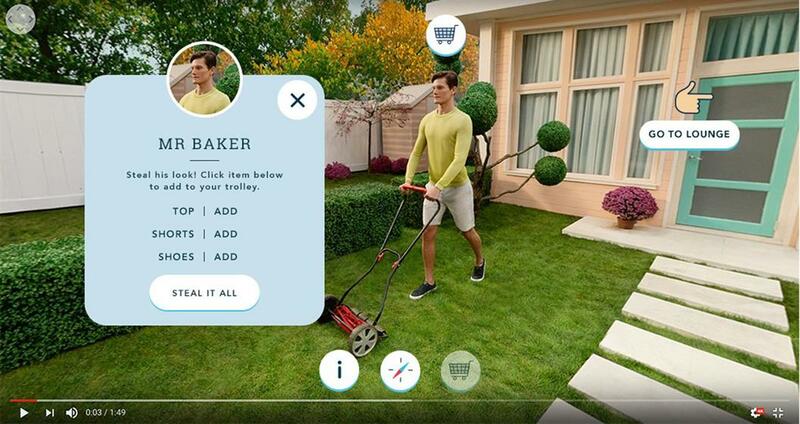 This elaborate introduction to a Stepford-Wives-perfect universe where the fashionable Baker family lives is all leading up to the "tentpole" launch of the campaign, a 360° fully shoppable ad which debuts tomorrow. "It’s an important technical piece for us and we’re keen to have all emphasis leading up to that," Craig Smith, Ted Baker’s brand communication director, explained. "We’re using Instagram Stories as well to link everything together cohesively." Crafted by Ted Baker’s in-house team, Happy Finish and Wirewax, the shoppable film will be hosted on TedBaker.com, Asos.com (UK) and Nordstrom.com (US). Customers get to poke around the Baker home, reveal hidden content, and purchase the collection as worn by the characters. This campaign is a global one for Ted Baker with its in-store activations taking place in 40 stores across seven markets including countries in North America and Asia-Pacific. "What we do online is push people into the stores. We know that 90% of all sales are in physical retail. It also allows people to negate with and have a feeling and sense of the brand," Smith said. Once customers are in store, Ted Baker aims to engage and delight with an immersive VR version of "Keeping up with the Bakers" via branded Google Cardboard devices. The brand has also worked with Nexus Studios' Interactive Arts Division to create an interactive window at select Ted Baker locations. When passers-by place their hands against the glass, it triggers a camera, which places the user within the window itself and snaps the moment for the brand’s social channels. Although the 360° shoppable film is new to the brand, a non-traditional, tongue-in-cheek campaign isn’t (see Mission Impeccable). "We know there is a very po-face approach to the fashion industry. But Ted Baker aims to enjoy itself, have fun. We want to be a brand people enjoy engaging with and that we bring a smile to someone’s face," Smith said. Ted Baker has never advertised on traditional media and also does not engage a creative agency or a media agency. "We’ve never done it that way and we’ve grown that way and we like that approach," Smith said. "We are a business and brand that has a very large range of customer types. We cater for consumers aged 15 to 65. Within that, we know we’ve got to marry up customer groups with their preferred ways of communicating. So we tailor content accordingly for wherever you are and whatever device you’re using." The team learnt quite a bit while working on Mission Impeccable, he continued: "We learnt that there is a need for extremely tailored content specifically for Facebook, Instagram, Twitter and Snapchat. We’re really concentrating hard on creating assets that really get the most out of each channel." As a result of their efforts, Mission Impeccable’s trailer was watched 1.9m times, and garnered 19,000 likes on its social campaign. Its in-store window engagement was even more successful with 26,000 giveaways. One noticeable element in the "Keeping up with the Bakers" campaign is that the Bakers, and the neighbourhood they live in, are white. When asked about the lack of diversity in the campaign, Smith said: "We travel a lot, we talk to our teams, we visit agencies, we talk to creative third parties, customers tell us that they like the fact that we are a distinctly British brand." The issue is a tricky one, he continued: "We don’t want to tick all the boxes with ethnicity and politicise the campaign. Our campaigns over the last eight or nine years had an enormous variety of models and ethnicity. We don’t choose our cast other than when it represents the collection or the narrative of the season."